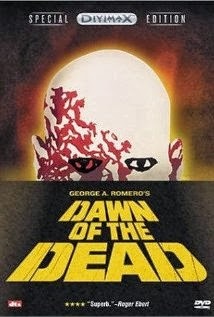 Tonight's movie for #undeadOctober was the original Dawn of the Dead from 1978. We have already watched the remake this month, but I will try not to compare between them too much. I had meant to watch this one first, but it was not available on any of the streaming services so I had to order the physical DVD. I have always thought that this was a pretty good zombie movie for the time. It doesn't hold up that well against current standards, but for what it is, I think it is still a fun movie. It has a lot of the aspects that I have mentioned before that I really like about zombie movies. The big one being that it is the end of the world and people are still trying to make a life for themselves. And with the run of the whole mall, they get to spend a lot of time trying to decide how they want to live. One of the big disappointments about the movie is the makeup. It is too bad that they went for quantity and didn't focus that much on the quality of the makeup for each zombie. I guess you have to draw the line somewhere, but it was a little too much on the quick and dirty side for me. Some of them were so bad that it looked like they just applied a little white/blue makeup to their faces and called it good. The other thing that makes the movie not hold up to current standards is the pace. Having just watched the original Night of the Living Dead, I understand that older zombie movies were very slow. The problem is that there just wasn't a lot going on in this one. Since they survivors appeared relatively safe, the drama basically melted away. They didn't seem to be running out of water, food, or even electricity anytime soon. I think it would have been a lot better if there was just a little more drama or time element to their safety. Either way, I still think it is a movie worth checking out. As for the zombies, they were the "everyone is already infected" type, but with a little different spin on it. They didn't mention bacteria or viruses in this one. Instead, they mention that "when hell is full the dead will walk the earth" as a means of explaining the dead rising again. I think that is an interesting idea, except for that it is a little too religious for me. However, after a quick search online, it appears that that line isn't even from the bible and was made up for the movie, which I think is a good approach. Now for the quick zombie review. We are about half way done and still have lots more zombie movies on the way. Hope you are having as much fun reading these as we are watching all of the movies. Let us know if you have any suggestions of movies you would like us to watch next.